About a year and a half ago, I embarked on a solo trip around the world. It lasted about three and a half months and I ended up visiting more than 23 different countries. My goal was to hit all seven continents, and I was able to make that happen. At the top of my list was Antarctica. It was even more amazing than I had expected: the waddling penguins, the icebergs, and the vast snowscapes. I wrote a post last year that explains how to make that trip happen for yourself. The countries I visited are: Argentina, Antarctica, Spain, England, Italy, The Netherlands, Morocco, Cameroon, Rwanda, Uganda, Zambia, Zimbabwe, South Africa, Namibia, Swaziland, Lesotho, Mozambique, United Arab Emirates, Thailand, Hong Kong, Singapore, Malaysia, Australia, French Polynesia (Tahiti and Bora Bora), and Trinidad. My favorite continent was Antarctica, and my favorite country was Morocco. However, each place had something special that was worth celebrating. I had some beautiful experiences like camping overnight in the Sahara Desert, and sand boarding in the Namib Desert. I visited some incredible stone sites like Great Zimbabwe, the Coliseum, and Stonehenge. Animal interactions were plentiful in Africa, like gorilla trekking in Rwanda, and walking cheetahs in Zambia. Things went wrong sometimes, like when my ship hit an iceberg on the way back from Antarctica. But in the end, I was refreshed and ready to take on normal life again. The biggest thing I learned is that we have to make things happen or they will for ever remain wishes and dreams and bucket list items. The world is such a big place. I feel incredibly glad that I made this experience happen. Everyone should travel whenever they can. Nothing else compares to the experience of being in a new place, learning about new cultures, eating new food, and meeting new people. 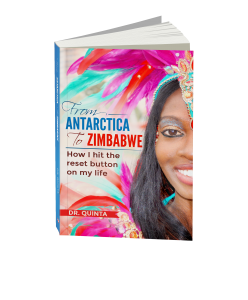 You can read more about my adventures around the world in my new book From Antarctica to Zimbabwe: How I hit the reset button on my life. It’s available through Amazon and other outlets in both print and e-book. It will be released on June 26, 2017 but you can preorder now. Please leave a review if you enjoy the book. Thanks for reading! Until next time, live young and travel.